The bolt-on AXS-R5 recorder works with the PMW-F55 and PMW-F5 cameras to record the highest quality 16-bit RAW 2K/4K images. The recorder works with sleek, optional AXSM™ memory cards, which are compatible with an affordable optional USB 3.0 reader, the AXS-CR1.Once on a PC, the RAW files can be screened using Sony’s free RAW Viewer software. AXSM memory provides a super fast, affordable format for sensational quality recordings. Record RAW at your choice of resolutions: the PMW-F55 and PMW-F5 captures native 4K or beautiful, derived 2K.RAW recording preserves the greatest latitude for colour correction and other post processes. Sony’s 16-bit recording captures more tonal values than the human eye can differentiate.Sony RAW retains 16 times as many Red, Green and Blue gradations as 12-bit RAW and 64 times as many tones per channel as 10-bit recording. Sony 16-bit linear RAW is also the ideal point of entry into the 16-bit linear Academy Color Encoding System (ACES) workflow. The AXS-R5 recorder works with sleek, high-capacity AXSM™ memory cards, which are compatible with an affordable optional USB 3.0 reader, the AXS-CR1. Once on a PC, the RAW files can be screened using Sony’s free RAW Viewer software. AXSM memory provides a super fast, affordable format for sensational quality recordings. The AXS-R5 allows you to record up to 240 fps 2K RAW with the F55 and up to 120 fps 2K RAW with the F5, with free planned upgrades, achieving the highest frame rates most productions will need, while retaining exceptional, 16-bit image quality. Sony provides a coordinated “off-line, on-line” workflow with simultaneous recording for the F55 and F5 cameras to internal SxS cards and the AXS-R5 RAW recorder.For seamless conforming in post, you get matching timecode, start frame, stop frame, file names and other metadata. 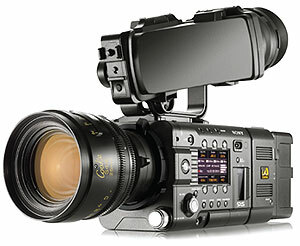 Sony understands a fundamental truth: working cameras require practical workflows.That’s why the AXS-R5 is part of a larger production platform that includes affordable media cards, affordable card readers, free RAW Viewer software and compatibility with popular NLEs and finishing tools. The AXS-R5 is designed to bolt-on seamlessly to the F55 and F5 cameras, allowing the cameras to maintain a sleek, lightweight and ergonomic design. Both recorder and camera chassis are only slightly wider than a typical PL-mount prime lens, perfect for 3D rigs.